We don't normally throw big birthday parties for our children, especially our babies. But, as is the case with everything in Addison's life, his first birthday was much different then the 8 before him. milestones and accomplishments (like 8 road trips, across more than 5000 miles and growing 8 inches) so we just wanted to celebrate. And while Addison was the catalyst for this special day, the guests of honor were all those people who have played a specific part in encouraging us through this first and very special year, some through prayer, some through letters, some through hands on help or a hug at just the right moment. It may have been Addison's birthday but this party was about celebrating God's blessings and those people who have chosen to walk this journey with us. We started with just Addison's prayer group on the guest list. But as we talked we just had to include one more person and one more... until Sunday afternoon arrived and we realized there were 62 people surrounding our son. 62 people who in one specific way or another helped him to reach this first year milestone. That is so incredibly humbling! Many, O LORD my God, are thy wonderful works which thou hast done, and thy thoughts which are to us ward: they cannot be reckoned up in order unto thee: if I would declare and speak of them, they are more than can be numbered. And that is what we wanted to focus on in this celebration, the countless blessings God has given us in and through Addison's life. People are always asking us how we design and plan an event and all the details which go into it. I thought this would be a good chance to share a little of what is behind planning a fun event. Most of what we do is not necessarily expensive, just a lot of thought and plenty of elbow grease. When we are asked to do an event or when we are hosting a party, we always need a starting point. It is usually just one tiny thing that we start brainstorming on. In the case of Addison's party, I wanted to use the red and turquoise colors a friend had chosen for the prayer and celebration we had for Addison before he was born. 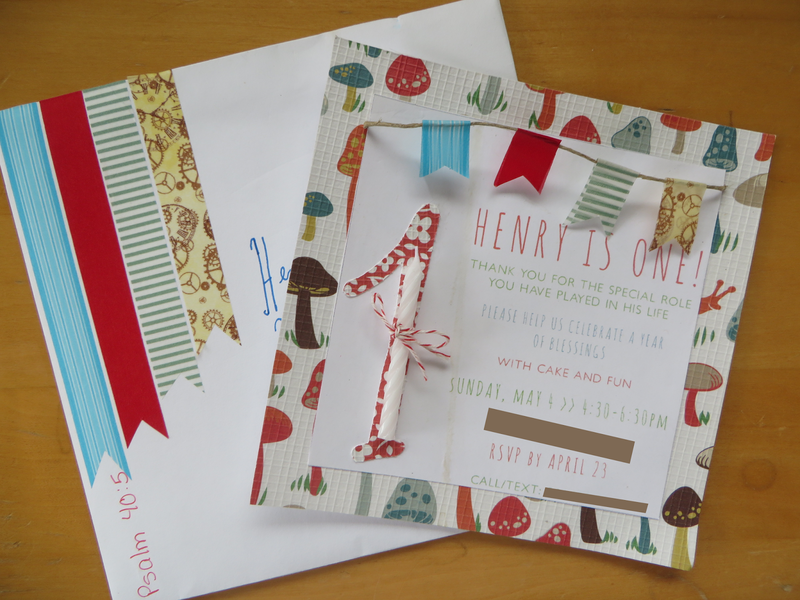 From that we were looking for paper to make the invitations and we found an adorable woodland themed package of scrapbook paper at Joann's. And before you knew it, Addison's first birthday was a woodland themed party. All good parties start with a great invitation. Email or text may be quicker and cheaper but a good invite sets the tone for the celebration ahead. The cricut, some twine, and washi tape and this collaboration, if I do say so myself, was simply fabulous. I love the way it came out. And it was a great way to spend a very cold and rainy Saturday. So then we start running with our theme. The centerpieces came from and an idea we saw in Yankee magazine to make a beach themed terrarium. The fishbowls came from the dollar store. The deer were plastic and the owls and mushrooms we made out of clay and painted. We cut burlap into strips for the runners and added moss from eBay. While we were looking for supplies Brianna came across these adorable woodland outfits so even the kiddos coordinated with our theme. So the idea is with a little thought you end up with something like this. Usually, I prefer foil balloons for their staying power. But this party just needed good old fashioned latex balloons. Our family has a tradition of sharing praises and blessings for the birthday person. Brianna made this guest book with photos of Addison's first year for guests to share how Addison has blessed them this year and to write their blessings for his next year. The only catch is, I don't think people realized they were supposed to write on the picture pages. We found these little moss squirrels and rabbits on the internet. They were the perfect addition to our theme. The simplest things, like a few strips of red polka dot ribbon and some of our matching paper behind the guest book sign, up the beauty of your party by 110%. A party can be great but what is even greater is when your guests can reflect on it in the coming weeks and get a smile on their face. We like to always send our guests home with a memento. Bubbles, a ball and crayons. 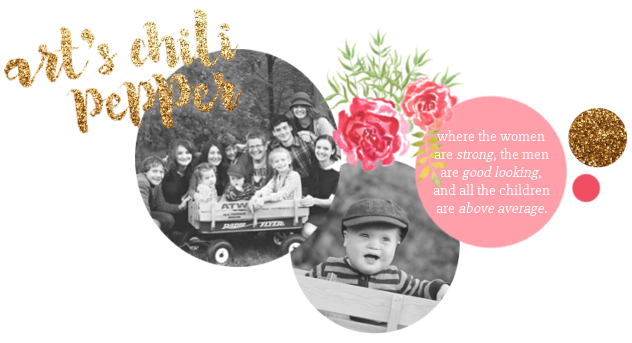 We also included a note card for them to write to a child in the hospital telling them how they were fearfully and wonderfully made by God. Sam dragged this stump up from the woods and it was the perfect place to display the sign to designate which favors were for the kids and which for the adults. At the last minute Kaitlin decided to sew mini owls for all the kids. I thought they would be perfect, but I also thought she was crazy to try and make 28 with no real time left to do it. But she did it! And they were perfect. And they were a huge hit. Go KK! You can check out her owls at A Stitch In Lives. For the adults we had tulip bulbs... which it turns out are not so easy to come by in April. We ended up buying a bunch of potted tulips left over from Easter at our local grocery store. In addition to care instructions we shared the story of why the tulips were significant to our family. Nathaniel, our map guy, determined there were 5 states represented. Aunt Dawn even drove in from Ohio. Love this photo of Addison and Madison checking out the owl together. Addison was completely engrossed in baby Annika. This was the first time he's ever taken notice of a baby. It was so sweet watching him. Henry was passed from friend to friend to friend. Ladies were completely shameless about snatching him from each other. If you lack for party games for your event, just invite a few friends with babies. No better entertainment than watching the baby pass. I think it is always a good idea to have some activities for the younger crowd. In this case we made party hats for the children to decorate with woodland animals. It took a lot of time to prep these but they were adorable and very inexpensive to make. Unfortunately, they kept sliding off of the kids heads. You win some, you lose some. Kaitlin, Aunt Dawn and another friend did face painting for the little ones and the boys made balloon animals. Every party must have some good food. With Easter and two complete dinners for 60 just two weeks behind us, I decided to keep it simple with just cupcakes and punch. We actually bought the cupcakes from Sam's club. I swear they have the most delicious chocolate cupcakes (must have the chocolate whipped icing) that I have ever tasted. We made them ours by adding green sprinkles to look like grass, mushrooms we made out of fondant, and brown candles to look like little trees. We were a little concerned that people might want more to eat so when guests asked what they could bring we said, "appetizers." I am guessing since we didn't serve dinner and the last guest didn't leave until midnight, everyone had a good time. and you end up with one very amazing first birthday celebration! I love all of it, every little touch is so precious... my very favorite is your idea to write a card to a child at Children's hospital. When we were there with Mackenzie, it meant so much to get cards and little gifts from thoughtful people we didn't even know. We still have all of those cards. We know we will be back at Children's again some time in the next year with our little P, and we are looking forward to seeing her healthy! I am continually amazed at the effort and love you put into these gatherings. I love the woodland theme. Three cheers for the Wachter gang! Wow, you are one amazing woman, to have such lovely parties on top of everything else you do! Can't believe Addison is 1 already. I was 30 on April 26- can't believe it either! Totally adorable!! I love it! !